A University of Wyoming department head has received a Department of Energy (DOE) grant to study mixed-phase convective clouds in the marine boundary layer in the Arctic. Bart Geerts, a UW professor and head of the Department of Atmospheric Science, recently received a $605,405 DOE grant for his project, titled “Mixed-Phase Convective Clouds in the Polar Marine Boundary Layer.” The grant, announced July 31 by the DOE’s Office of Biological and Environmental Research, begins Aug. 15 and runs through Aug. 14, 2021. Zach Lebo, a UW assistant professor of atmospheric science, will serve as co-principal investigator on the project. Yonggang Wang, a research assistant professor of atmospheric science at Texas Tech University, also is a member of the research team. “This grant is part of a larger effort to study mixed-phase convective clouds in the marine boundary layer in the Arctic,” Geerts says. 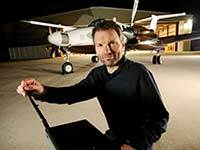 He also is the principal investigator of a multimillion-dollar proposal to the DOE Atmospheric Radiation Measurement (ARM) to deploy the ARM Mobile Facility in northern Norway, as well as a separate ARM station on a remote island called Bjornoya (Bear Island), located 500 kilometers north of Scandinavia’s northern shores. The larger facility deployment project is referred to as Cold-Air Outbreaks in the Marine Boundary Layer Experiment or COMBLE. “COMBLE will involve 12 sea containers of radars, lidar and a host of other atmospheric sensors, as well as at least three DOE personnel, for a five-month period from January through May 2020,” Geerts says. This summer alone, Geerts is traveling twice to the area of interest, for site selection. The broader context of this research is climate change, which is happening at a faster rate in the Arctic than elsewhere, Geerts says. Clouds are an integral part of the amplification of global warming in the Arctic. The new DOE Atmospheric System Research grant will enable the study of these clouds using COMBLE data and other data collected by the DOE ARM instrument suite, Geerts says. Geerts says the project also includes funding for one Ph.D. student.